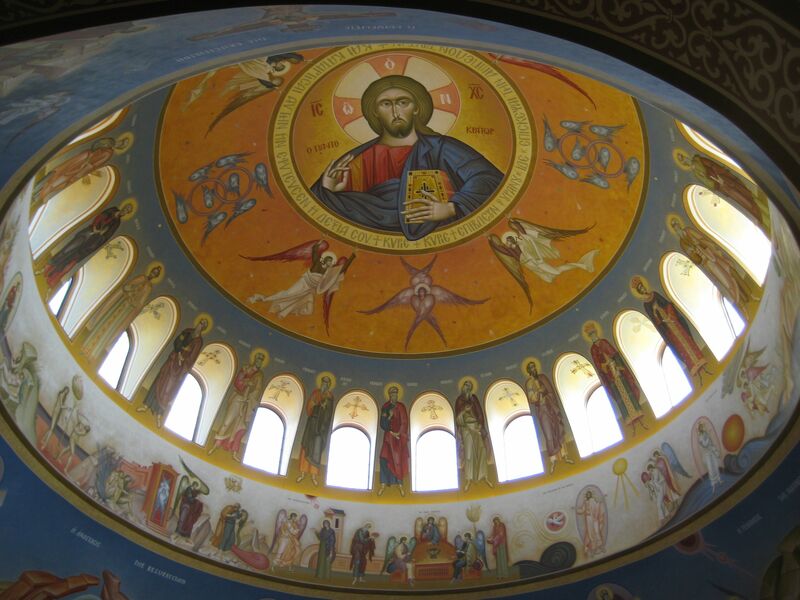 In January, we started attending Holy Apostles Greek Orthodox Church in Indianapolis. I had been there once before; they had hosted one of the Indianapolis-area Sunday Vespers services that occur during Lent two years ago, and I was invited to help chant by one of the people who helps coordinate those services. Everybody at the parish was very warm and welcoming, as well as seemingly appreciative of the chanting help, and I’ll tell you what, if the drive hadn’t been such a conceptual barrier at that point (and if Flesh of My Flesh hadn’t been in Germany for the year and therefore not able to participate in such decisions), I would have started going there regularly right there and then. So, when it became clear that a change of air was inevitable and necessary, my first thought was Holy Apostles. It wasn’t the shortest drive (~1:10), but it also wasn’t the longest, and the memory of them being as nice to me as they had been had really stuck with me in the intervening year and a half. We decided to go after the New Year, on a more or less non-committal basis; however, it’s not stretching things too far to say that that first Sunday, they rather insistently adopted us, and we’ve been there ever since, missing only a Sunday in February when all three of us were sick as dogs. As regards chanting, they talked to me about it our first Sunday there, and I was actually planning on just standing in the congregation with my wife and child for a month or so, but when we came back the second Sunday, let’s just say that I found myself unambiguously summoned. At any rate, I have been able to contribute what makes sense to me to contribute, and it has worked well. The other couple of cantors, a couple of Greek gentlemen who belong to the previous couple of generations, have been very generous and just as hospitable as everybody else; they want me to sing what I’ve been trained to sing, be it in Greek or English, and it seems to have been received well thus far. Others in the congregation have been very helpful in terms of helping Megan with Theodore, and that’s also been very much appreciated. I also have to say, acoustically, it’s a nice little church in which to sing — that is to say, while it’s not a resonant cathedral, I also don’t feel like I have to push at 200% every time I open my mouth to be heard. It’s a favorable enough acoustic that it’s pleasant to sing and I can still talk at the end of the morning. Holy Apostles meets in the freestanding side chapel of a large Disciples of Christ congregation in central Indianapolis; it is a really lovely building, and they have been able to do a lot with it. While it’s not exactly spacious, it’s basically everything they need, and it works just fine for the most part. The cantors wind up standing in the sanctuary, but that’s a practice with ample historical precedent, I suppose, and it works well enough with the space considerations. Right now, Holy Apostles only meets every other Sunday — as a small community getting established in a rented space, it’s what they feel is the most practical thing for them to do right now, plus they are only serving Divine Liturgy on the Sundays they do meet, not Orthros (another practical necessity, since the host congregation uses the chapel for an early morning service). That has its upsides and downsides for us — it’s meant we haven’t felt like we’ve missed much by commuting, certainly, and we have a relatively easy Sunday morning when we go, but it’s also been hard to feel like a rhythm has gotten established, and it underscores that, as wonderful and embracing as everybody has been, we’re at some distance from the community. The lemonade-from-lemons that I’m trying to make from that is chanting at Holy Trinity Greek Orthodox Church on Holy Apostles’ off-Sundays; that’s been harder, because while they do Orthros, it starts at 8:15, so I’ve got to leave here around 6:45am. There are a couple of other couples/families in our peer group who are also driving up there semi-regularly, so how we’re trying to work it for now is I go up for Orthros, while Megan and Theodore come up with one of the other families. Holy Trinity has also been very welcoming to us, and their protopsaltis has been extraordinarily gracious in letting me help, given the irregular basis that I’m there. They’ve also just completed the first major stage of frescoing their new building; iconographer Dr. George Kordis and his team were in residence for a few weeks, painting the dome, the cornices, and the sanctuary. When we were there last he had just finished, and he gave a fascinating talk about the work they had done; the talk alone was worth the drive for the morning. So, that’s how things have shaken out for us for the time being. We’re members at Holy Apostles, while also floating to Holy Trinity semi-regularly on Holy Apostles’ off-Sundays. I may also float to St. George every so often after this summer; I’m doing an intensive first-year Arabic program, and while I have scholarly applications for that, I’m also doing it, at least in part, to gain some facility with it as a liturgical language. So, we’ll see. Glad to see you have found a good community.